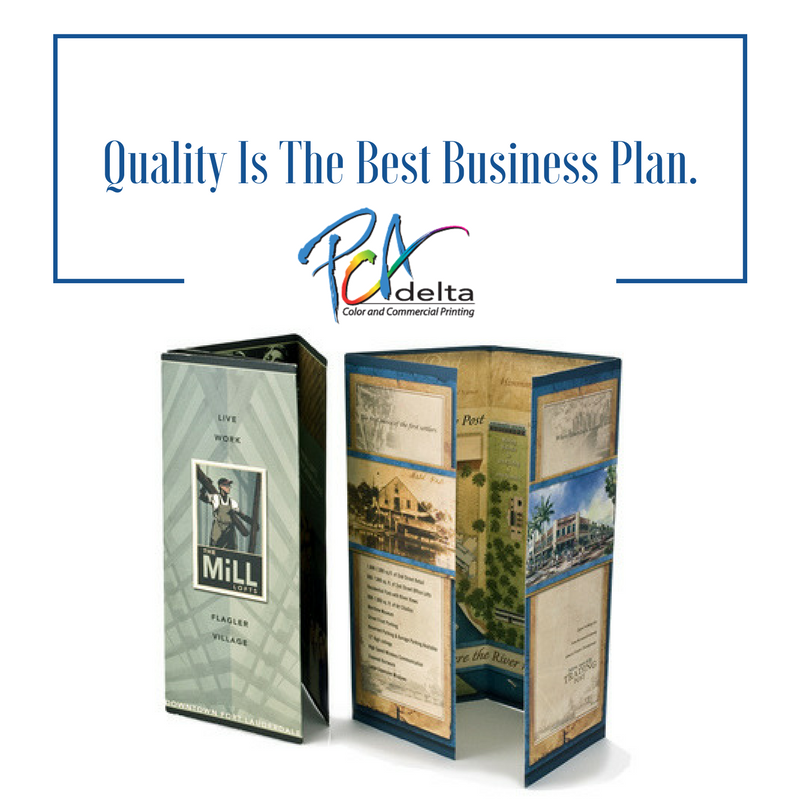 PCA Delta provides a variety of brochures to choose from to meet your professional needs. There are five brochure designs that are often chosen by our customers. They are tri-fold, bi-fold, Z or accordion fold, double gate-fold and two parallel-fold. If you're looking for an effective and inexpensive way to introduce a new product or service, brochures are a great way to advertise upcoming programs or events; they can be added to promotional press kits, sent out by direct mail, displayed in public buildings or given away at events. The paper is folded in half giving it four panels. Usually, the cover will feature the company name, the middle two will contain the content and the back will include contact information for the company. One of the most popular design for brochures. The paper is folded twice giving it six panels. As with the bi-fold, the contact and company information will be on the front and back with the content inside. The paper is folded in half and then each side is folded inwards resulting in eight panels. It is an inexpensive choice when there is a lot of content to be included. The paper is folded twice in alternating directions resulting in six panels. This is a good design choice for travel brochures and for highlighting images. The paper is folded in half and then in half again resulting in eight panels. The best choice for a specific brochure will usually depend on its purpose and a reputable brochure printer will be able to advise pros and cons. This month PCA Delta is offering a special on 2 sided and tri fold brochures, click here to access this great deal!